New York (TADIAS) — From the Nyala chair — inspired by the mountain antelope that is endemic to Ethiopia– to the Kebero and Mukecha stools as well as the Ashanti seats from Ghana and the Maasai chair from Kenya, there is nothing like Jomo design when it comes to contemporary furniture style representing a diverse array of African aesthetics. 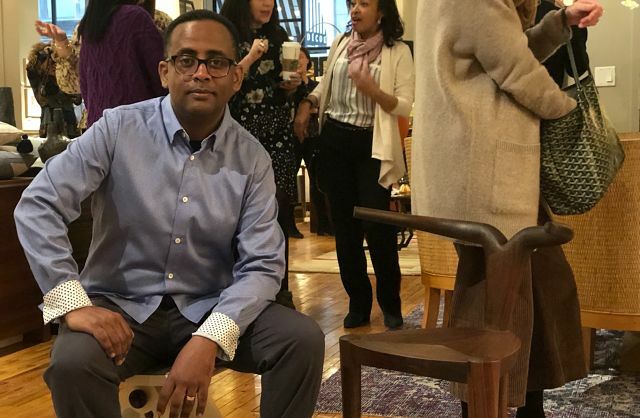 Jomo Furniture, founded by Ethiopian American designer and entrepreneur Jomo Tariku, was featured in New York City at the spring preview of the Black Artist & Designers Guild (BADG), which was held on Tuesday, February 12th at Décor NYC in the Chelsea neighborhood of Manhattan. In addition to Jomo Furniture the spring preview also included works by Malene B. Atelier (ceramics), Lisa Hunt (fine art), Kelly Marshall (photography), Nasozi Kakembo (textiles), Marie Burgos (furniture), Livvy & Neva (pillows), Sheila Bridges Home (wallpaper), Da Brand (home accessories), and Studio Lani (Lighting). Jomo tells us that his furniture is available for licensing, and the designs could be manufactured for any potential large orders including “pieces for lodges and hotels as well as any residences that want to create unique spaces.” We couldn’t agree more. You can learn more about Jomo Furniture at www.jomofurniture.com.